The series was initially known as the BAA Finals prior to the 1949–50 season when the Basketball Association of America (BAA) merged with the National Basketball League (NBL) to form the NBA. The competition oversaw further name changes to NBA World Championship Series from 1950 to 1985, as well as a brief stint as the Showdown, before settling on NBA Finals in 1986. The NBA Finals was initially structured to harbor a 2-2-1-1-1 format. In 1985, it was changed to a 2–3–2 format to ease the amount of cross country travel until 2013, where the first two and last two games of the series were played at the arena of the team who earned home-court advantage by having the better record during the regular season. In 2014, the 2–2–1–1–1 format was restored. The first two are played at home for the higher-seeded team, and the following two at the home of the lower-seeded team. The following three are played at each team's home arena alternately. A total of 18 franchises have won the NBA Finals, with the Golden State Warriors the current champion. The Boston Celtics hold the record for the most victories, having won the competition 17 times, as well as winning the competition the most times in a row, winning it eight times from 1959 to 1966. The Los Angeles Lakers have contested the NBA Finals the most times, with 31 appearances. The Eastern Conference has provided the most champions, with 38 wins from ten franchises; the Western Conference has 32, from nine franchises. The previous NBA Finals logo, used until 2017. The Boston Celtics went 11–1 in the NBA Finals during 13 seasons (1956–57 to 1968–69). They won eight straight NBA championships from 1959 through 1966. This period marks the largest stretch of seasons that a single team made up over 65% of Finals appearances, and also includes the only ever time the NBA Finals was decided in double overtime. 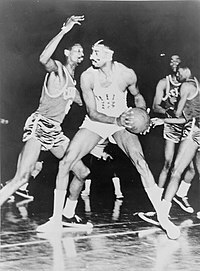 With the establishment of the Celtics dynasty in 1957 spearheaded by center Bill Russell, the team saw great success, only ever encountering difficulty when up against teams led by Wilt Chamberlain. However, for most of the late 1950s and 1960s, the Celtics and Russell managed to have an upper hand on Chamberlain's teams. In 1964, Chamberlain, who had moved to the state of California alongside his team, led the San Francisco Warriors to a Western Conference championship, but again failed to conquer the Celtics. The following season, he returned to the Eastern Conference to join the Philadelphia 76ers, who were the former Syracuse Nationals that had relocated to the city to cover the vacancy created with the departure of the Warriors. The first clash between the two stars in the playoffs was in 1966, with Boston winning the series 4–1. In the following season, Philadelphia coach Alex Hannum instructed Chamberlain to provide an increased focus on playing a team game, to avoid drawing the double-teams that troubled Chamberlain during the Finals. This tactical change brought the team to a new record of 68 wins the following season, as well as defeating the Celtics before winning the Finals. In 1968, Boston overcame a 3–1 deficit against Philadelphia to once again arrive in the Finals. They went on to defeat the Los Angeles Lakers in the Finals to again become NBA Champions. In 1969, the Celtics faced great difficulty entering the postseason, as they had an aging team and multiple injuries to a number of players. They qualified for the playoffs as the fourth and final seed in the East, while the Lakers, who had added Chamberlain in the offseason to join stars Jerry West and Elgin Baylor. The Lakers won the West and were prohibitive favorites to become Champions for the first time since relocating to Los Angeles. Despite holding a 2-1 advantage going into Game 4, the Lakers led 87–86 and had the ball with 10 seconds to play. But after a turnover, Sam Jones scored to give the Celtics a narrow 88–87 win and tying the series. The series was eventually tied 3-3 going into Game 7 in Los Angeles, with Lakers owner Jack Cooke hanging balloons in the arena in anticipation of a Lakers victory. West also picked up injuries to his thigh and hamstring during the series, however, returned to play for the final game. Russell utilized this newly lacking mobility in West to organize fast breaks at every opportunity for the Celtics, which allowed them to gain an early lead. They held off a furious Lakers comeback to win 108–106 and win the series, and win their eleventh championship in 13 years. As many stars either declined or retired following this win, it is largely recognized as the last NBA Finals conducted by the Celtics dynasty. The 1970s saw eight teams win the title, with the Celtics and New York Knicks winning twice. In 1970, a classic final featured the Knicks against the Lakers. In the waning moments of Game 3, with the series tied, Jerry West hit a basket from 60 feet to tie the game, a shot which became one of the most famous ever. However, the Knicks won in overtime and continued their momentum for a 4–3 win, becoming the first team after the Celtics dynasty to win an NBA championship. The Milwaukee Bucks also won their first franchise title, defeating the Baltimore Bullets in 1971. Two seasons after losing in the Finals, the Lakers got a measure of revenge by winning 33 straight games, the longest such streak in NBA history. By season's end, they broke the record for most wins in a season with 69, one more than the 1966–67 Philadelphia 76ers, before taking home the championship for the first time since relocating to Los Angeles. The Knicks returned to win the championship round again a season later to record their second ever victorious season. Despite the rise of the Knicks, the 1974 championship returned to the Celtics, as newly formed players led by Dave Cowens demonstrated excellent teamwork and resilience to win in seven games to secure another title. Following the success of the Lakers, the 1970s were characterized by a major breakthrough of the league's western franchises. In 1975, after compiling a 48–34 regular-season record, the Golden State Warriors swept the Washington Bullets 4–0 in the 1975 NBA Finals. In 1976, the Phoenix Suns, who only enjoyed eight years of existence as a franchise, overcame a losing record early in the season to build a remarkable win streak to finish 42–40. The events culminated in upset victories over the Seattle SuperSonics and the Warriors, before facing Boston in the Finals. The teams split the first four games, before Game 5 went into three overtimes before Boston won 128–126. The Celtics managed to secure their 13th championship quickly after, defeating the Suns 87–80 in Game 6. Other franchises that won their first titles in the 1970s included the Portland Trail Blazers in 1977, and the Washington Bullets defeating the SuperSonics in 1978. The SuperSonics managed to exact revenge in the following season, however, as they won their first franchise title in 1979. Between 1980 and 1990, the Celtics, 76ers, Lakers, or the Detroit Pistons won every NBA Finals. From 1980 to 1990, the Lakers won five titles (1980, 1982, 1985, 1987, and 1988); the Celtics won three (1981, 1984, and 1986); the Pistons won twice (1989 and 1990); and the 76ers won once (1983). The 1979 NCAA Men's Division I Basketball Championship Game featured Magic Johnson's Michigan State University team facing off against Larry Bird's Indiana State University team. 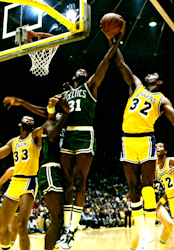 This meeting has been immortalized as the beginning of the Lakers and Celtics rivalry of the 1980s, which pitted those two NBA teams represented respectively by Johnson and Bird. It also attracted the largest TV rating ever for an NCAA Championship game, as 38 percent of all television viewers that night tuned in. Bird had actually been drafted the year before, but later decided to stay an additional year, and the two superstars both entered the league in 1979, leading their respective teams to dazzling heights. Johnson and the Showtime Lakers reached the 1980 NBA Finals against the 76ers, which were also led by NBA superstar Julius Erving. The Lakers took a 3–2 lead, but Kareem Abdul-Jabbar could not play in Game 6 due to injury. Johnson, a natural point guard, was shifted to center, and ended up playing every position on the court during the game, scoring 42 points, while also attaining 15 rebounds and 7 assists to win his first championship while being awarded his first NBA Finals MVP; a remarkable performance in the annals of the sport. Boston reached the 1981 NBA Finals led by the "Big Three" of Larry Bird, Kevin McHale, and Robert Parish. During the 1980 NBA draft, the Celtics traded two first round picks to the Warriors for Parish and a first round pick later spent on McHale. Considered to be one of the best front courts of all time, all three players later made the Naismith Memorial Basketball Hall of Fame. They met the Houston Rockets in the 1981 Finals, practically single-handedly carried by Moses Malone, who upset the Lakers and Johnson in the first round. The Rockets were only the second team in NBA history to make the Finals after posting a losing record in the regular season, and the Celtics had an NBA best record of 62–20. The Celtics later won the Finals in 6 games. The Lakers returned to the NBA Finals in 1982, this time led by new coach Pat Riley, in a rematch against the 76ers. The 76ers defeated the Celtics in the Eastern Conference finals in a 7-game series, but were defeated by Lakers in 6 games, with Johnson being named Finals MVP. Upon losing their past three NBA Finals appearances, the 76ers decided that they needed one more piece to become champions, and enlisted Malone as their premier target. On September 15, 1982, they traded for Malone, who was also the league's reigning MVP. With the new duo of Malone and Erving, the 76ers won the 1983 NBA Finals, losing only once in the entire playoffs, as well as sweeping the Lakers. However, the 1984 NBA Finals was conducted by the Celtics and Lakers, who faced each other for the first time since 1969. After an inspired performance from Bird, the Celtics toppled the Lakers 4–3. The final game of this series attracted the largest ever TV audience for an NBA game, and the second-largest ever for a basketball game, with only the game between the two stars played five years earlier having a larger audience. It was the last NBA Finals played in the 2–2–1–1–1 format, until 2014. In the 1985 NBA Finals, the Lakers made amends for their previous eight losses to the Celtics by defeating them in six games. Even though the Lakers lost the first game by 34 points in the Memorial Day Massacre, they won 4 of the next 5 games, including Game 6 at the Boston Garden, to finally end the long years of frustration of failing to defeat the Celtics. These finals were the first to be played in the 2–3–2 format, which was suggested by Boston coach Red Auerbach to NBA commissioner David Stern, as he hoped to cut back on the frequent traveling from Boston to Los Angeles. The 1986 NBA Finals saw the Celtics face off against the Rockets, with Boston winning in six games, as well as securing their 16th title. Bird was also named Finals MVP for the second time. In 1987, the Lakers and Celtics met again, with both teams holding a win in the Finals apiece. With the third being contested, it is regarded as a rubber match between the two dynasties. The Lakers won the first two games, but Boston won Game 3. In Game 4, Johnson hit a hook shot with two seconds left to give the Lakers a 107–106 win and a 3–1 series lead. The Lakers lost Game 5, but eventually won Game 6 to clinch the series, and a 2-1 win against the Celtics. Johnson was named Finals MVP for the third time. In the following two seasons, the aging Celtics failed to reach the Finals, becoming overshadowed by the rise of the Detroit Pistons. The Lakers managed to defend their title in the 1988 Finals, winning the series in 7 games against the Pistons. They then became the first team to win back-to-back NBA titles since 1969. Seeking a three-peat in 1989, the Lakers were swept by the Pistons in a rematch of the previous year's Finals. In 1990, the Pistons then went back-to-back after defeating the Clyde Drexler led Portland Trailblazers in five games, attaining the nickname "Bad Boys" due to its rough, physical play. Led by a Hall of Fame back court in Joe Dumars and Isiah Thomas and a rugged front court in Dennis Rodman and Bill Laimbeer, the Pistons attained great success. The majority of the 1990s was marked by the supremacy of the Chicago Bulls. The Bulls, led by head coach Phil Jackson and star players Michael Jordan and Scottie Pippen, won six titles in six Finals appearances from 1991-1998. The only other team to win a title during this time was the Houston Rockets who won titles in 1994 and 1995, during Jordan's first retirement from professional basketball. The first championship came at the expense of the Los Angeles Lakers, which also saw the last appearance in the Finals for Magic Johnson. Billed[by whom?] as a showdown between the aging Johnson and the upstart Jordan, the Lakers won the first game, 93–91. For the rest of the series, Pippen guarded Johnson, allowing Jordan a free scoring, and Chicago won the next four games. The Bulls returned to the Finals the next year, pitted against Clyde Drexler and the Portland Trail Blazers. Throughout the 1991–1992 season, Jordan and Drexler led their teams to the best records in their respective conferences, leading to several comparisons between the two players in anticipation of a postseason match-up. Chicago defeated the Trail Blazers in Game 1 by 33 points, a game notable for Jordan breaking the record for the most three-pointers in a first half, with six. Game 2 went into overtime, with the Trail Blazers outscoring the Bulls 18–7 in the final period to win the game, even with Drexler fouling out in the 4th quarter. Games 3 and 4 were split between Chicago and Portland, respectively, but the Bulls won the final two games, clinching their second championship. In 1993, Jordan was matched against close friend Charles Barkley, who was the league's reigning MVP of the Phoenix Suns. The Bulls won the first two games in Phoenix, 100–92 and 111–108. The Suns, rallying behind Barkley, won Game 3, 129–121 in Chicago in triple overtime. The Bulls won Game 4, 111–105, with Jordan scoring 55 points and tying Rick Barry for the second-most points in an NBA Finals game. The Suns won Game 5, 108–98, sending the series back to Phoenix. Chicago clinched the series in Game 6, 99–98, on John Paxson's three-pointer, as the Bulls became the third team in history to three-peat. After this win, Jordan retired from basketball to pursue a career in baseball. Following Jordan's departure, the Houston Rockets, led by Hakeem Olajuwon, won the 1994 and 1995 NBA titles. During this time, Olajuwon became the only player in history to win the NBA MVP, NBA Defensive Player of the Year and Finals MVP awards in the same season. That was the only year that both the NBA and NHL Finals went to seven games, with the Rockets facing the New York Knicks in 1994. With their win in Game 7, the Rockets denied New York from winning both the NBA and NHL titles in the same year, as the New York Rangers won the 1994 Stanley Cup Finals. After trading for Clyde Drexler midseason, the Rockets later swept an Orlando Magic team consisting of Shaquille O'Neal and Penny Hardaway in the 1995 Finals; Olajuwon was again named Finals MVP, and the Rockets became the fifth franchise to win back-to-back titles and became the first 6th-seeded team to win the title without enjoying home court advantage on any of their playoff series. The Houston Rockets also beat teams with at least 50 regular season wins in every round of the playoffs, with "Road Court" advantage. No other team in NBA History has done that. The Houston Rockets were down 3 games to 1 to the Phoenix Suns in the Semi-Finals and won 2 out of 3 games on the road, including game 7 to advance to the Conference Finals. After his short stint with baseball, Jordan returned to basketball late in the 1994–95 season. Although he did not lead the Bulls to the Finals, he returned to pre-retirement form the next season while the team acquired perennial rebounding champion Dennis Rodman. The 1995–96 Bulls finished the regular season 72–10, attaining, at the time, the best regular season record in NBA history. They dominated in the playoffs, with series records of 3–0, 4–1 and 4–0, before facing the Seattle SuperSonics in the NBA Finals. After the Bulls took a 3–0 series lead, Seattle won the next two games after coach George Karl switched point guard Gary Payton onto Jordan, leading to a sixth game. However, Jordan altered his game to accommodate the advances of Payton, and the Bulls won Game 6 to win their fourth title. In 1997 and 1998, the Bulls met the Utah Jazz in the Finals twice. Led by Olympians John Stockton and Karl Malone, the Jazz were defeated in both Finals by the Bulls in six games. In both series, Chicago won by hitting winning shots in the sixth game, the first by Steve Kerr in 1997 in Chicago, and the second by Jordan in Utah in 1998. This saw Chicago winning their sixth NBA championship, and winning their second three-peat. However, prior to the lockout shortened 1998–99 season, Jackson decided to retire, which set off a chain reaction that resulted in most of the team, including Jordan and Pippen, requesting to leave the Bulls. With no foundation of youth to build upon, the Bulls became a lottery-bound team for the next six seasons. The Los Angeles Lakers and San Antonio Spurs combined to win nine NBA Championships during this period. The Spurs were responsible for winning four championships during this time, in 1999, 2003, 2005, and 2007. In the 1999 NBA Playoffs, the Spurs finished with a 15–2 mark, including sweeps of the Blazers and Lakers. With a defensive squad led by David Robinson and Tim Duncan, San Antonio's 84.7 points allowed per game was the fewest average points allowed in the post-season in the last 30 years. In the Finals that year, the Spurs played against the New York Knicks, the first #8 seed team to reach the finals in NBA history, to an average of 79.8 points per game. During the 2003 NBA Finals, the Spurs defeated the New Jersey Nets in 6 games, which also marked the first championship contested between two former ABA teams. In Game 6, Duncan was two blocks short of recording the first quadruple-double in NBA Finals history, finishing with 21 points, 20 rebounds, 10 assists, and 8 blocks. The Spurs went on to defeat the Detroit Pistons 4–3 in the 2005 NBA Finals, as well as sweeping the LeBron James-led Cleveland Cavaliers in the 2007 NBA Finals. 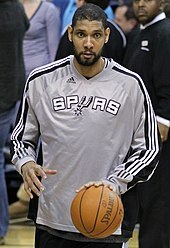 Duncan won the Finals MVP in 1999, 2003 and 2005. In 2007, Tony Parker was named MVP, becoming the first European-born player to win the award. Tim Duncan won five championships with the San Antonio Spurs from 1999-2014. From 2000 to 2002, the Lakers, led by Shaquille O'Neal and Kobe Bryant, won three straight NBA Championships. O'Neal won the finals MVP all three times. Their first championship came at the expense of the Indiana Pacers, whom the Lakers defeated in 6 games. During their 2001 postseason run, the Lakers swept their first 3 series and won the Finals in 5 games, finishing with an unprecedented 15–1 record, the best postseason record in NBA history. Their opponent in the Finals that year were the Philadelphia 76ers, led by Allen Iverson. In the 2002 NBA Finals, the Lakers swept the New Jersey Nets, leading almost the entire time in each game; only for a short while after the beginning of Game 4 did the New Jersey Nets gain any significant lead in any game. In the 2003 offseason, veteran stars Gary Payton and Karl Malone signed with the Lakers. Along with Bryant and O'Neal, they formed what many expected to be one of the best teams in NBA history, and were the favorites to win the championship in 2004. However, the Detroit Pistons, under coach Larry Brown, eliminated the Lakers in 5 games. Chauncey Billups was named the Finals MVP. Now established as one of the premier powerhouses of the East, the Pistons returned to the NBA Finals the following year, before losing to the Spurs in seven games. The 2006 NBA Finals were the only Finals during this time not to feature the Spurs or Lakers, instead featuring the Miami Heat and Dallas Mavericks. It was the first NBA Finals since 1971 that had both Western and Eastern Conference champions making their first Finals appearance in franchise history. The Mavericks won the first two games at home, but the turning point of the series was in Game 3, when the Heat overcame a 13-point deficit with less than 6 minutes left in the fourth quarter to win 98–96. The comeback was led by Dwyane Wade's 12 points in the final six minutes and a clutch outside jumpshot by Gary Payton, who was appearing in his third NBA finals. 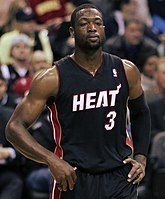 Miami won all three of their home games, two of which were sparked by fourth quarter comebacks led by Wade; the Heat won their first championship in game six. The Lakers returned to the finals in 2008, against the Boston Celtics. Renewing the teams' rivalry, this marked the 11th time that these two teams met in the Finals, the last meeting happened in 1987. The Celtics, who defeated the Lakers 4–2, were led by their "Big Three" superstars of Ray Allen, Kevin Garnett, and Paul Pierce, who was also named Finals MVP. The Lakers bounced back from their 2008 loss and returned to the Finals in 2009, where they faced the Orlando Magic, led by Defensive Player of the Year Dwight Howard in 2009. The Lakers defeated Orlando in five games, with Bryant earning the Finals MVP award. The Lakers met the Celtics once again in 2010, trailing 3–2 before winning the last two at home, marking the first time in the history of the Celtics that they lost a Game 7 in the NBA Finals. 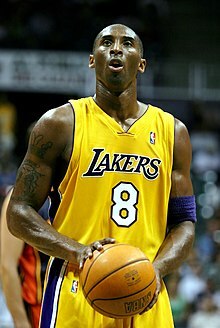 Bryant was named Finals MVP, with the triumphs in 2009 and 2010 becoming Phil Jackson's 10th and 11th NBA titles. With these championship victories, Jackson surpassed Red Auerbach's record for most NBA titles of all time. He also passed Auerbach's and National Hockey League coach Scotty Bowman's record for most titles as head coach in any major American professional sport. LeBron James (left) and Chris Bosh (right) joined Dwyane Wade (center) at the Miami Heat to form the Big Three. During the 2010 offseason, the Miami Heat re-signed team captain Dwyane Wade and added free agents LeBron James and Chris Bosh to form their Big Three. The Heat were then considered the favorites by many to win multiple championships. They appeared in the next four finals, winning two in 2012 and 2013. The Heat's second appearance in the Finals came in 2011, where they were pitted against the Dallas Mavericks in a rematch of the finals from five years earlier. The Mavericks, led by Dirk Nowitzki, Jason Terry, Tyson Chandler, and Jason Kidd, won the series 4–2, with Nowitzki being named the Finals MVP. The Heat returned to the finals in the following year against an Oklahoma City Thunder team featuring future MVPs Russell Westbrook, James Harden, and 3-time NBA scoring leader Kevin Durant. After the Thunder won Game 1 at home, the Heat won four straight games to win the series 4–1, becoming the first team to win a championship after trailing in three playoff series. James won his first championship and was unanimously named NBA Finals MVP. The Heat repeated as champions in 2013, this time over the San Antonio Spurs, with the finals being the first since 1987 to feature four former Finals MVPs in the Finals; with Tim Duncan (1999, 2003, 2005) and Tony Parker (2007) for the Spurs, and Wade (2006) and James (2012) for the Heat. The Spurs went up 3–2 in the series, but the Heat bounced back with a Game 6 victory, notable for a game-tying three-pointer by Ray Allen in the closing seconds of regulation to send the game into overtime. The game is considered one of the greatest playoff games in NBA history. The Heat won Game 7, 95–88, to clinch the title. James was named Finals MVP for the second straight year. Looking for a three-peat, the Heat reached the 2014 NBA Finals and faced the Spurs in a rematch of the 2013 Finals. With James limited in Game 1 due to leg cramps, the Spurs ended the game on a 31–9 run, winning 110–95. The Heat bounced back in Game 2, but that was their only win of the series, as the Spurs won games 3 and 4 in Miami and game 5 at home to win the championship, their first since 2007 and the fifth and final title of Duncan's career. Kawhi Leonard was named Finals MVP, becoming the third-youngest Finals MVP after Duncan and Magic Johnson. The Cleveland Cavaliers and Golden State Warriors have met in every NBA Finals between 2015 and 2018, becoming the first two teams to meet in four consecutive Finals. Previously, no two teams have appeared in more than two consecutive finals. Stephen Curry led the Golden State Warriors to both the best regular season and postseason records in NBA history, and 3 championships. After the 2014 Finals, LeBron James became a free agent and returned to the Cleveland Cavaliers where he teamed up with Kyrie Irving. The Cavs also traded for Kevin Love to form a new "Big Three" in Cleveland. In the 2015 postseason, the defending champion Spurs were eliminated in the first round while the other 2014 finalist Heat failed to qualify for the playoffs. Golden State, spearheaded by 2014-15 MVP Stephen Curry, achieved a 67–15 record and managed to take the West, while the Cavs won the East as James, along with James Jones who played for both the Heat and Cavaliers, made their fifth straight finals appearance – the first two players to do so since the 1960s Celtics. The Warriors defied conventional wisdom and traditionalist ideas with a small-ball, three-point shooting, fast-paced team. The Cavs were without star Love due to an injury suffered earlier in the playoffs, and also lost Irving to injury in a Game 1 overtime loss in the 2015 NBA Finals. James rallied the Cavaliers to win Games 2 and 3, but the Warriors won the next three games after coach Steve Kerr made the adjustment of inserting the sixth man Andre Iguodala into the starting lineup in place of center Andrew Bogut, thus achieving the desired small-ball offense. The Warriors won the title, with Iguodala becoming the first player to win the Finals MVP award without starting a regular season game that season. Kevin Durant joined the Warriors in 2016, and won back-to-back NBA Finals MVP awards as a member of the team. 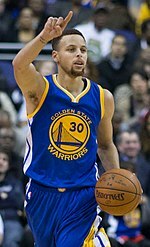 During the 2015–16 season, the Warriors broke the record for most wins in a season with a record of 73–9 and Curry won his second straight MVP award, as well as becoming the first unanimous MVP in history and shattering his own record for three-pointers made in a single season by over one hundred in the process. The Warriors fell to a 3-1 deficit in the Western Conference Finals against a Kevin Durant-led Oklahoma City Thunder team, but won three straight elimination games to take the series and advance to a second straight Finals. The Cavaliers finished the season as the top seed in the Eastern Conference and won their first 10 straight playoff games, ultimately defeating the Toronto Raptors 4–2 in the Eastern Conference Finals to ensure the rematch of last year's Finals. In the 2016 NBA Finals, the Warriors got out to a 3-1 lead, but James and Irving led the Cavs to two straight victories to force a deciding Game 7. In a key sequence with two minutes remaining in Game 7, LeBron James made a memorable chase-down block on Iguodala to keep the game tied, while Irving hit a 3-point shot a minute later to take the lead. Cleveland managed to hold on to the lead to win the title and end the city's 52-year championship drought, with James earning his third Finals MVP honor. In the 2016 offseason, the Warriors acquired Durant through free agency. After finishing 67–15, they became the first team in history to win 67+ games in three straight seasons, they went to the Finals with a 12–0 sweep of the West, the first team to do so since the first round changed to best-of-seven in 2003. Meanwhile, though the Cavaliers slipped to the second seed going into the playoffs, they only lost one game en route to defeating the Boston Celtics in the Eastern Conference Finals, setting up another match against the Warriors in the 2017 NBA Finals. The Warriors started strong with a 3-0 lead over the Cavs, eventually winning the series in five games with Durant being named Finals MVP. The Warriors set a playoffs record of 15 consecutive wins and a 16-1 final record, as well as a 13.5-point differential in the Finals. The Cavaliers traded away Kyrie Irving in the 2017 offseason and continued to change their roster throughout the season, while the Warriors largely remained intact. Neither Cleveland nor Golden State earned the top playoff seed in the 2017-18 season. Both teams fell to 3-2 deficits in their respective Conference Finals, before both winning game 7s to ensure the rematch for a fourth consecutive Finals in 2018. LeBron James appeared in his eighth consecutive NBA Finals since 2011, four each with the Heat and the Cavaliers. The Warriors went on to sweep the Cavaliers in four games, and Durant was again named Finals MVP. The statistics below refer to series wins and losses, not individual games won and lost. For individual game statistics, scroll further downwards. 31 Minneapolis/Los Angeles Lakers 16 15 .516 2010 2010 Currently hold the record for the most appearances in the NBA Finals, and have appeared in the Finals in every decade since the 1940s. They have won 11 titles in Los Angeles and 5 in Minneapolis. They also attained a three-peat in Minneapolis from 1952 to 1954, and another in Los Angeles from 2000 to 2002. The Lakers have defeated 8 different NBA franchises in the NBA Finals and lost to 5, both records. 21 Boston Celtics 17 4 .810 2010 2008 Won 8 straight titles from 1959 to 1966, and are the most successful team in the NBA Finals, winning 17 championships. 3 of their 4 Finals losses occurred against the rival Lakers. 10 Philadelphia/San Francisco/Golden State Warriors 6 4 .600 2018 2018 Won two titles in Philadelphia, before eventually winning four more as the Golden State Warriors, including three in four years between 2015 and 2018. 9 Syracuse Nationals/Philadelphia 76ers 3 6 .333 2001 1983 Won one title in Syracuse, before winning another two following the move to Philadelphia. 8 New York Knicks 2 6 .250 1999 1973 In their most recent appearance, they became the first 8th seed to ever reach the Finals. 7 Fort Wayne/Detroit Pistons 3 4 .429 2005 2004 Went back-to-back in 1989-90, and won all three championships in Detroit. 6 Chicago Bulls 6 0 1.000 1998 1998 All six titles were with head coach Phil Jackson and players Michael Jordan and Scottie Pippen. The titles were won via two three-peats, from 1991–93 and 1996–98. They are the only active NBA franchise with multiple Finals appearances, and no losses. 6 San Antonio Spurs 5 1 .833 2014 2014 All five titles were with Tim Duncan and Gregg Popovich. They are the only franchise to move from the ABA to the NBA, and subsequently win a championship. 5 Miami Heat 3 2 .600 2014 2013 All three titles were with Dwyane Wade; one with Shaquille O'Neal, two during LeBron James' 4-year tenure in Miami, during which they made the Finals each year. 5 Cleveland Cavaliers 1 4 .200 2018 2016 LeBron James featured in all five Finals appearances. The Cavaliers appeared in four straight Finals from 2015-2018, all against the Golden State Warriors, winning in 2016. 4 Houston Rockets 2 2 .500 1995 1995 Won back-to-back championships with Hakeem Olajuwon and coach Rudy Tomjanovich. Their 1995 triumph was done as the 6th seed, the lowest seeded team in NBA History to win a championship. 4 St. Louis/Atlanta Hawks 1 3 .250 1961 1958 All appearances when the team was in St. Louis. 4 Seattle SuperSonics/Oklahoma City Thunder 1 3 .250 2012 1979 Hold a record of 1–2 as Seattle SuperSonics, and 0–1 as Oklahoma City Thunder. They remain the only franchise since 1977 to win a title in one city and later relocate. 4 Baltimore/Washington Bullets/Washington Wizards 1 3 .250 1979 1978 All appearances in the Finals came between 1971 and 1979, featuring Wes Unseld. They were 0–1 as the Baltimore Bullets, and 1–2 as the Washington Bullets. 3 Portland Trail Blazers 1 2 .333 1992 1977 Their only title was won with Bill Walton. The team lost two finals with Clyde Drexler. 2 Dallas Mavericks 1 1 .500 2011 2011 They lost in 2006 and won in 2011, both times against the Heat. Both Mavericks teams were led by Dirk Nowitzki. 2 Milwaukee Bucks 1 1 .500 1974 1971 Their triumph was recorded with a team that consisted of Oscar Robertson and Kareem Abdul-Jabbar. 2 New York/New Jersey/Brooklyn Nets 0 2 .000 2003 None They appeared twice in the Finals as the New Jersey Nets, in 2002 and 2003. 2 Orlando Magic 0 2 .000 2009 None They lost both of their Finals appearances, winning just one game between the two series. 2 Phoenix Suns 0 2 .000 1993 None Lost in the 1976 and 1993 Finals to the Celtics and Bulls, respectively. Best historical won-loss record among all franchises to have never won a title. 2 New Orleans/Utah Jazz 0 2 .000 1998 None Both appearances were with coach Jerry Sloan and players Karl Malone and John Stockton, and losses to the Bulls. 1 Rochester/Cincinnati Royals/Kansas City-Omaha Kings/Kansas City Kings/Sacramento Kings 1 0 1.000 1951 1951 Only appearance in NBA Finals and was won as the Rochester Royals. 1 Indiana Pacers 0 1 .000 2000 None Only appearance was in 2000 and led by Reggie Miller and coach Larry Bird, losing to the Lakers. 1 Baltimore Bullets 1 0 1.000 1948 1948 Team folded in 1954 and is the only championship-winning team to fold. 1 Chicago Stags 0 1 .000 1947 None Team folded in 1950. 1 Washington Capitols 0 1 .000 1949 None Team folded in 1951. Buffalo Braves/San Diego/Los Angeles Clippers 46 1970 Reached three conference semifinals as the Braves, and four as the Clippers. First appeared was in the 2005–06 season and lost to the Phoenix Suns, before returning in the 2011–12 season, losing to the San Antonio Spurs. Their other appearances came in the 2013–14 season when they lost to the Oklahoma City Thunder, and in the 2014–15 season when they lost to the Houston Rockets. Denver Nuggets 40 1976 Joined NBA in 1976 after nine years in the American Basketball Association (ABA). They have played in the 1976 ABA championship, but lost to the New York Nets, as well as participating in the 1978 conference finals, before ultimately losing to the Seattle SuperSonics. They also featured in the 1985 and 2009 conference finals, but lost both times to the Los Angeles Lakers. Minnesota Timberwolves 27 1989 Reached the Western Conference finals in the 2003–04 season, but lost to the Lakers. Charlotte Bobcats/Hornets* 28 1988 Reached the conference semifinals four times, first in the 1992–93 season when they lost to the New York Knicks, second in the 1997–98 season, losing to the Chicago Bulls, third in the 2000–01 season when they lost to the Milwaukee Bucks, and fourth in the 2001–02 season, losing to the New Jersey Nets. Vancouver/Memphis Grizzlies 21 1995 Reached the Western Conference finals in the 2012–13 season, but lost to the San Antonio Spurs. Toronto Raptors 21 1995 Reached the Eastern Conference finals in the 2015–16 season, but lost to the Cleveland Cavaliers. New Orleans/Oklahoma City Hornets/Pelicans* 16 2002 Reached the conference semifinals twice, first in the 2007–08 season when they lost to the San Antonio Spurs, second in the 2017–18 season when they lost to the Golden State Warriors. (*) As a result of the original franchise's relocation to New Orleans, the NBA team in Charlotte suspended operations for the 2002–03 and the 2003–04 seasons, before a new team, named the Bobcats, was established for the 2004–05 season. In 2014, the original Hornets were renamed the Pelicans and obtained the records during their time in New Orleans and Oklahoma City from 2002 to 2013. The Bobcats became the second incarnation of the Charlotte Hornets, and retained the history and records of the Hornets organization from 1988 to 2002. (*) the number in parentheses describes the victories in the Finals for either team. 179 Los Angeles Lakers 89 90 .497 Holds the record for the most games in a Finals, with a record of 20–15 in Minneapolis and 69-75 while in Los Angeles. Won 4-3 in their last Finals appearance in 2010. 129 Boston Celtics 77 52 .597 Recorded the first ever sweep in the Finals. Lost 4-3 in their last Finals appearance in 2010. 53 Philadelphia 76ers 24 29 .453 Includes a record of 9–11 while in Syracuse, and 15-18 while in Philadelphia. Lost 4-1 in their last Finals appearance in 2001. 53 Golden State Warriors 32 21 .604 Includes records of 10–6 while in Philadelphia, 3–8 while in San Francisco, and 19-7 in their current incarnation. Won 4-0 in their last Finals appearance in 2018. 48 New York Knicks 20 28 .417 Lost 4–1 in their last Finals appearance in 1999. 40 Detroit Pistons 22 18 .550 Includes a record of 4–8 while in Fort Wayne, and 18-10 while in Detroit. Lost 4-3 their last Finals appearance in 2005. 35 Chicago Bulls 24 11 .686 Won 4–2 in their last Finals appearance in 1998. 34 San Antonio Spurs 23 11 .676 Won 4–1 in their last Finals appearance in 2014. 29 Miami Heat 15 14 .517 Lost 4-1 in their last Finals appearance in 2014. 25 Atlanta Hawks 11 14 .440 All appearances in the Finals occurred while the team was in St. Louis. 23 Houston Rockets 12 11 .522 Won 4-0 in their last Finals appearance in 1995. 23 Oklahoma City Thunder 10 13 .435 Includes a record of 9–9 while in Seattle, and 1-4 while in Oklahoma City. Lost 1-4 their last Finals appearance in 2012. 22 Cleveland Cavaliers 7 15 .318 Lost 4-0 in their last Finals appearance in 2018, as well as becoming the only team in the Finals to overcome a 3-1 deficit in 2016. 20 Washington Wizards 5 15 .250 Includes a record of 0–4 in Baltimore and 5–11 in Washington, all as the Bullets. 17 Portland Trail Blazers 7 10 .412 Lost 4-2 in their last Finals appearance in 1992. 12 Dallas Mavericks 6 6 .500 All games played during the Finals have been against the Heat, and won 4-2 in their last Finals appearance in 2011. 12 Phoenix Suns 4 8 .333 Lost 4-2 in their last Finals appearance in 1993. 12 Utah Jazz 4 8 .333 Lost 4-2 in both Finals appearances in 1997 and 1998, both times against the Bulls. 11 Milwaukee Bucks 7 4 .636 Lost 4–3 in their last Finals appearance in 1974. 10 Brooklyn Nets 2 8 .200 All Finals appearances have occurred while the team was in New Jersey, and lost 4-2 in their last Finals appearance in 2003. 9 Orlando Magic 1 8 .111 Lost 4-1 in their last Finals appearance in 2009. 7 Sacramento Kings 4 3 .571 All appearances have occurred while the team was in Rochester. 6 Baltimore Bullets 4 2 .667 Franchise defunct. 6 Indiana Pacers 2 4 .333 Lost 4-2 in their last Finals appearance in 2000. 6 Washington Capitols 2 4 .333 Franchise defunct. 5 Chicago Stags 1 4 .200 Franchise defunct. ^ Ballard, Bill (June 4, 1989). "Here Are Some Final Facts on NBA Playoffs". Los Angeles Times. Associated Press. Archived from the original on March 26, 2015. ^ "Boston Celtics History". Boston Celtics. Retrieved January 22, 2017. ^ "NBA.com: Magic Fills in at Center". nba.com. Retrieved 29 June 2015. ^ "NBA Season Recaps". NBA.com. 1 July 2014. Retrieved 29 June 2015. ^ Team Stream Now. "LeBron James and the Ghost of 23". Bleacher Report. Retrieved 29 June 2015. ^ Jones, Michael C. (June 19, 2013). "NBA Finals 2013, Spurs vs. Heat Game 6: The greatest game ever played?". Retrieved June 20, 2013. ^ Johnson, Jared. "NBA Finals Live: Cavs vs. Warriors in Game 7". Bleacher Report. Retrieved 2016-06-20. ^ "Powered by Kevin Durant, Warriors roll to second NBA title in three years". Retrieved 2017-06-13. ^ "G.O.A.T. Grade: Definitive proof the 2017 Warriors are the Greatest Team of All Time". Retrieved 2017-06-13. ^ "NBA : Golden State Warriors Finals appearances". mcubed.net. ^ a b c "NBA.com: Líderes en la historia de las Finales (Estadísticas)". NBA.com. Retrieved 29 June 2015. ^ "NBA.com: All-Time Records Index". nba.com. Retrieved 29 June 2015.